CHAD PLAUCHE-ADKINS The Marietta Times Cory Wilson touches up a tattoo at the Painted Sparrow on Front Street on Wednesday. He and Kat Watkins will be displaying their artistry at the inaugural Hidden Marietta Paranormal Expo on Saturday. Most people would react with fear if they encountered signs of paranormal activity in their everyday life. But for some, interacting with phenomenon from an unseen world is what they love to do. The inaugural Hidden Marietta Paranormal Expo on Saturday celebrates the passion that some people have for the spirit realm. Sponsored by Hidden Marietta, the expo will be from 11 a.m. to 5 p.m. at the Lafayette Hotel Ballroom on Front Street. Megan Keller, co-owner of Hidden Marietta, said the $10 entrance fee will allow visitors to learn about paranormal phenomenon through vendors and guest speakers. Keller said there will be readings given by River Rat Tarot, spiritual candles by Wicked Wicc’n Candles and spooky custom crafts by Witch House Leather to name just a few of the vendors. Keller said there would also be a booth for people to have their own ghost hunting evidence analyzed. “People can bring in their photos, EVP (electronic voice phenomenon, a recording of suspected spirit noises) or their videos,” she said. Keller said members of Hidden Marietta and other local ghost hunting troops will use their expertise to explain exactly what people’s documentation shows. Besides helping with translating images and sound, Tom Moore of the Mid-Ohio Valley Ghosthunters will be speaking about his past ghost hunting adventures as well as taking questions from people about their own experiences. Moore spoke of a particularly hair raising encounter that he will be sharing in more detail at the expo. Moore said he was wondering why someone would bring a little girl to the building when she took two steps down the stairs and disappeared. “I kind of just stood there in amazement,” he said. Moore said the Mid-Ohio Valley Ghosthunters want to help people in the area make sense of things they don’t understand. From strange sounds to cold pockets in a house, Moore said he wanted people to grasp the meaning of the phenomenon that is happening to them. Cory Wilson, owner of the tattoo parlor the Painted Sparrow, and Kat Watkins, an artist at the store, will be some of the vendors at the expo. The pair will be providing tattoos of whatever macabre vision the expo’s visitors might have in mind. Watkins said there would be some limitations at the Lafayette, though. 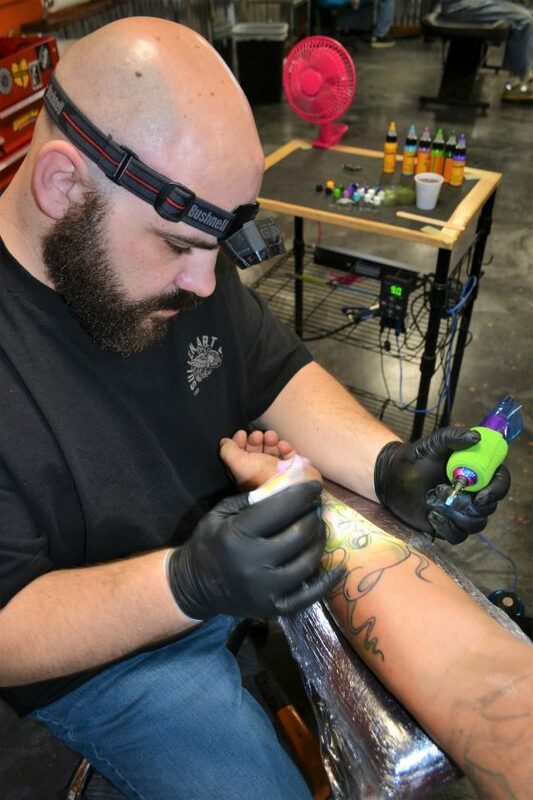 Watkins said the smaller tattoos should cost around $50 to $70 and they will give people the opportunity to schedule an appointment if they desire a larger piece. Wilson said creating tattoos outside of the Painted Sparrow shouldn’t create any problems. “All the equipment we have is portable,” he said. Keller said there are still four vendor spots available for people who have items for sale that are related to the paranormal. For more information visit Hidden Marietta’s Facebook page or visit their website at hiddenmarietta.com.